Eleven men were charged in a Singapore court recently in connection with a large-scale oil theft at Shell’s biggest refinery, while police said they were investigating six other men arrested in a weekend raid. Police in the island-state said they had detained 17 men, whose ages ranged from 30 to 63, and seized millions of dollars in cash and a small tanker during their investigations into theft at the Pulau Bukom industrial site, which sits just south of Singapore’s main island. Shipping data from showed the Prime South had been shipping fuel between Ho Chi Minh City, Vietnam, and Singapore for the past 30 days. The charges seen so far allege three incidents of gasoil theft: on Nov. 21, 2017, of more than 2,322 tonnes valued at S$1.277 million (706,490 pounds); and on Jan. 5 and 7 this year of a combined 2,062 tonnes of gasoil, valued at S$1.126 million. The Vietnamese nationals were charged with receiving gasoil in the early evening hours of Jan. 7, at wharf 5 at the heart of Shell’s operations on Bukomisland, the documents show. It is the second high-profile case of wrongdoing at companies in Singapore to hit headlines in recent weeks, after Keppel Corporation Ltd’s rig-building business agreed in December to pay more than US$422 million to resolve charges it bribed Brazilian officials. Singapore is also Southeast Asia’s main refinery hub and the world’s biggest marine refuelling stop. 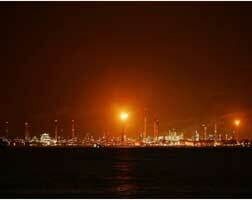 Shell is one of the biggest and longest established foreign investors in Singapore. Its oil refinery on Bukomisland can process 500,000 barrels per day. There has been a modest decline since then, although the organisation said in a quarterly report that oil theft was still “of concern,” especially in the South China Sea, off the east coast of Malaysia. The stolen fuel is generally sold across Southeast Asia, offloaded directly into trucks or tanks at small harbours away from oil terminals.